The Reluctant Internationalists research project (2013-2017) studied international organisations and movements in twentieth-century Europe through the lens of public health, medicine and medical science. It was funded by Dr Jessica Reinisch’s Wellcome Trust Investigator Award. This report provides an overview of some of the project’s most notable findings and contributions. There is no single model of international cooperation, but a history of overlapping and competing internationalisms built around an enormous range of political, cultural, religious and economic priorities. Appropriation of the term by Western liberal internationalists has obscured the histories of other versions developed by different political projects. This diversity of different internationalisms is powerfully brought into focus when attention is shifted away from the United States and Anglophone world, and instead to actors in supposed European borderlands or peripheries. Eastern and Southern Europe, in particular, served as laboratories for various internationalist projects before they were rolled out to other parts of the world. The two world wars have served as catalysts for international cooperation. Framing military crises as medical or public health emergencies stimulated the creation of international terminologies, procedures and organisations which subsequently stretched far beyond the public health field. Many of these continue to shape the world today. An actor-centred perspective that explores the history of internationalism from ‘the bottom up’ – through the perspectives of local and national actors, such as patients, children, refugees, soldiers and local officials – lays bare a complex set of motivations and agendas for international collaborations. This stands in stark contrast to the often more monolithic ‘top down’ views of internationalism by scholars of international diplomacy and international organisations that have dominated the scholarship to date. Failed international projects occupy important places in the history of internationalism and deserve to be studied in much greater depth than they currently are. Technical experts and expertise are central to the history of internationalism. Their efforts have defined the construction of international organisations, standards and networks, and reveal some of the persistent political, personal and professional tensions integral to all international projects. From the start, a key aim of the project was to assemble a team of exceptional researchers with complementary areas of expertise. The research group was led by Dr Jessica Reinisch, and comprised four full-time researchers (Dr Ana Antic, Dr David Brydan, Dr Johanna Conterio and Dr Dora Vargha), along with seven visiting researchers (Dr Holly Case, Dr Friederike Kind-Kovacs, Dr Elidor Mehilli, Dr Brigid O’Keeffe, Dr Jessica Pearson, Dr Francesca Piana, and Dr Heidi Tworek) and a visiting PhD student (Dr Casey Hurrell). In 2016-2017, the group was completed by two public engagement fellows (the historian Esther Kim and the children’s author-illustrator Francesca Sanna), and a public engagement and events coordinator (Siobhan Morris). The five core researchers’ case studies examined a range of different geographical settings and types of internationalist projects, and drew on diverse historical and historiographical tools and perspectives (including from social and cultural history, political history, economic history, medical history, history of science, intellectual history, history of psychiatry, and history of technology). One case study examined how Yugoslav psychiatrists navigated the transition from German fascism to post-war Communism so successfully by participating in international networks. A second considered how Francoist Spain, a pariah nation, used its health experts to find a way into the WHO and other international organisations – and how the strategies employed directly continued earlier attempts to build health networks with Fascist Italy and Germany. A third studied the role of German models of welfare in the development of Soviet approaches to public health, and the significance of socialist medicine more broadly on the field of ‘international health’ in the interwar years. A fourth focused on the work and impact of a short-lived but highly influential international body, the United Nations Relief and Rehabilitation Administration, whose activities in Europe dominated in the stretches of war-torn Europe that became the frontline of the emerging Cold War. 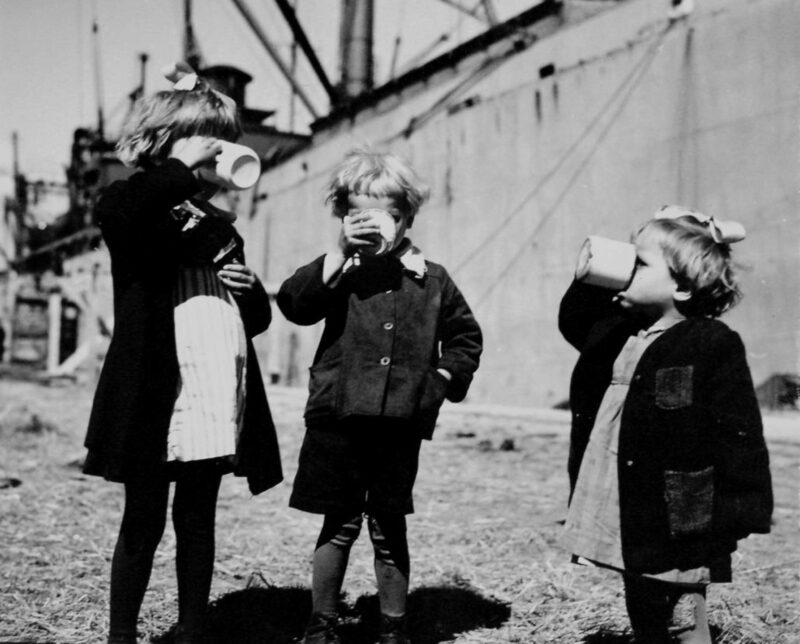 A fifth case study investigated the polio epidemics in Communist Hungary shortly after the Hungarian Revolution and identified the birth of an extensive network of global vaccine testing in the 1950s and 60s. Together, the research group grappled with the links, overlaps and differences between different internationalist projects that defined Europe’s twentieth century, and identified actors who moved between them. Their findings brought to light a range of political, social, cultural, economic, religious and linguistic factors that determined whether and how local actors thought or acted ‘internationally’, and thus helped to counteract a still widely popular ‘technocratic’ view of internationalism, which sees logistical or political obstacles as the primary barriers to international cooperation. Altogether, members of the group researched at over fifty archives and libraries around the world. Several researchers conducted oral history interviews for their case studies. All members of the group presented their findings at a range of forums and together gave a total of 90 research talks. Members of the group organised a series of conference panels and roundtable discussions, as well as twelve academic conferences and workshops at Birkbeck. The podcasts of some of these events can be found on the Reluctant Internationalist project’s SoundCloud channel or on Birkbeck’s iTunes channel. The organisers explored a range of different presentation and discussion formats at different events, ranging from short interventions and debates, to pre-circulated papers, standard conference-style presentations and commentaries. Each of these events brought together researchers from a variety of countries, academic institutions and disciplines, and set in motion new conversations and exchanges. The project’s final conference, ‘Languages of Internationalism’, was attended by around 60 scholars from history, anthropology, linguistics and many other fields, who debated the centrality of language to people’s pursuit and experiences of internationalism. The project team has published its research widely and for a range of different audiences. The first monograph published by a member of the research group was Ana Antic’s Therapeutic Fascism: Experiencing the Violence of the Nazi New Order (Oxford University Press, 2016) - awarded the 2015 Fraenkel Prize in Contemporary History. Elidor Mehilli’s new monograph, From Stalin to Mao: Albania and the Socialist World, was published by Cornell in 2017. Jessica Reinisch’s first monograph, The Perils of Peace (OUP, 2013), was re-issued as an Open Access eBook and became the most read title by Oxford University Press on Google Books in 2016. Dora Vargha’s monograph, Polio Across the Iron Curtain: Hungary’s Cold War with an Epidemic, is forthcoming with Cambridge University Press in autumn 2018. Francesca Piana’s monograph, Humanitarianism in Practice: Europe and its Displaced Populations after World War I, is under review with Cambridge University Press. Jessica Pearson’s monograph, The Colonial Politics of Global Health: France and the United Nations in Postwar Africa, 1945-1960, is forthcoming with Harvard University Press in September 2018. David Brydan’s monograph, Franco’s Internationalists: Social Experts and Spain’s Search for Legitimacy, is forthcoming with Oxford University Press in 2019. By the end of the project, the core researchers published 15 peer-reviewed journal articles and 5 book chapters between them, in journals such as Kritika: Explorations in Russian and Eurasian History, Social History of Medicine, The Lancet, Contemporary European History, Journal of Social History, History of Psychiatry, East European Politics and Societies, Food & History, The Bulletin of the History of Medicine, and The Political Quarterly. Members of the research group have commissioned and edited special issues, essay volumes, blogs and discussion forums. Edited collections proved to be a particularly effective medium for setting out key findings of the project’s new history of internationalism, and working collaboratively with scholars from different historiographical fields and approaches. The group commissioned a themed collection on the variety of historical actors who at different points in the twentieth century turned to the international sphere. Seven articles, as well as an introduction by Jessica Reinisch and a concluding essay by Ana Antic, Johanna Conterio and Dora Vargha, were published as a special issue of Contemporary European History in May 2016 entitled ‘Agents of Internationalism’. This issue was accompanied by a virtual special issue. Johanna Conterio is curator of a special forum on ‘The Black Sea in the Socialist World’, scheduled for publication in Kritika: Explorations in Russian and Eurasian Studies in 2018, drawing on the workshop of the same name she organised as part of the project. Jessica Reinisch co-edited two essay collections with Matthew Frank (Leeds): a volume of essays, entitled Refugees in Europe, 1919-1959: A Forty Years’ Crisis? (Bloomsbury, 2017), as well as a special issue of the Journal of Contemporary History on ‘Refugees and the Nation-State in Europe, 1919-1959’ in July 2014. 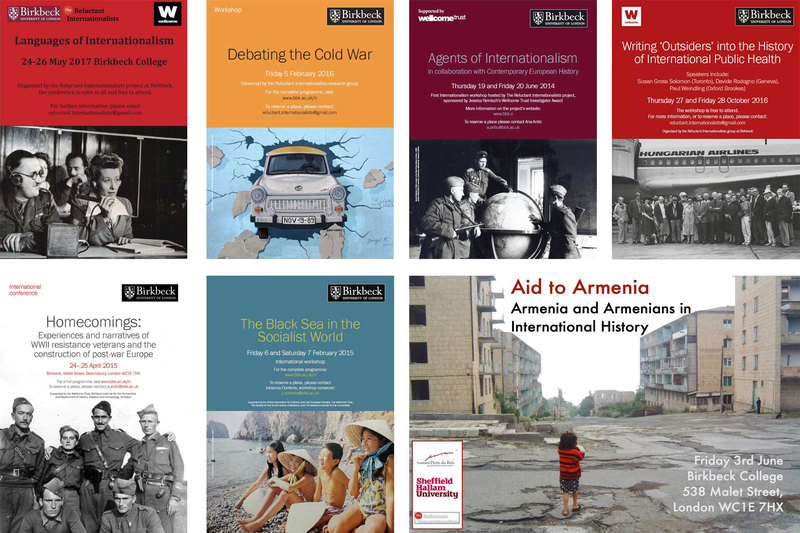 Francesca Piana and Joanne Laycock are editing a volume entitled Aid to Armenia: Humanitarian Aid, Relief and Interventions from 1890s to Present - drawing on their workshop at Birkbeck - which is forthcoming with Manchester University Press. In 2015/16, Jessica Reinisch and Dora Vargha published fifteen specially-commissioned essays from some of Europe’s leading historians in an online series entitled ‘Europe in Crisis’. Each article identified a theme of contemporary concern and debated how a historical perspective could help us to understand contemporary dynamics, patterns and potential solutions. Authors were invited to think about the architecture and institutions upholding European integration, as well as a much wider range of social, cultural and political problems: migration and refugees, national sovereignty, national security, regional inequalities and the idea of development, the notion of ‘burden sharing’, European ‘values’ and ‘civilisation’ and the extent of Europe and ‘Europeanness’ itself. A full list of contributions can be found here. 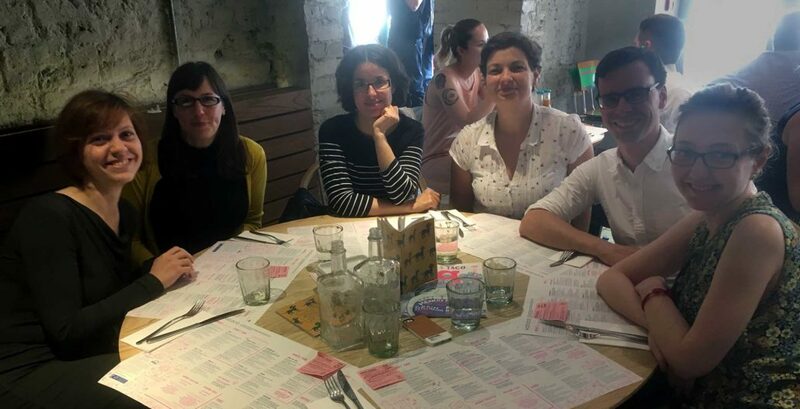 Dora Vargha commissioned and edited a series of blog essays on the theme of ‘After the End of Disease’ - first explored at a conference she organised as part of the project - for the interdisciplinary forum Somatosphere. The ten essays were written by historians, anthropologists and sociologists, and included Dora’s own contribution, entitled ‘After the End of Disease: Rethinking the Epidemic Narrative’. Dora Vargha is also an editor of the CEEHM Network. 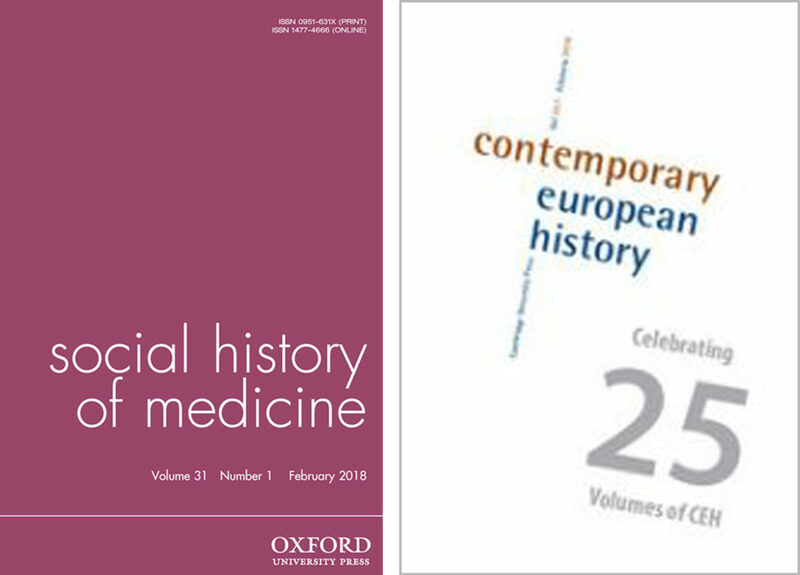 By the close of the project, two major academic journals are being edited by members of the project: Dora Vargha is editor of Social History of Medicine (published by Oxford University Press, 2016 impact factor of 0.676); Jessica Reinisch is editor of Contemporary European History (published by Cambridge University Press, 2016 impact factor 0.406). Members of the team have communicated their research in a series of press articles, including in The Guardian, The Conversation, El Pais, and The Lancet, and various online forums. The project group produced a termly newsletter (ten in total) sent out to 500 subscribers, and maintained a lively blog and social media presence on Twitter and Facebook. The project’s posts on Facebook regularly reached thousands of people. The Europe in Crisis series posts reached a total of 45,550 people on Facebook. The project’s Twitter posts had a total number of 253,005 impressions (as of January 2018). Podcasts: The project has its own SoundCloud channel containing 20 conference/ workshop podcasts. The total number of downloads as of January 2018 was 2,100, and more via Birkbeck’s iTunes channel. Project researchers received twelve grants and awards during the project. 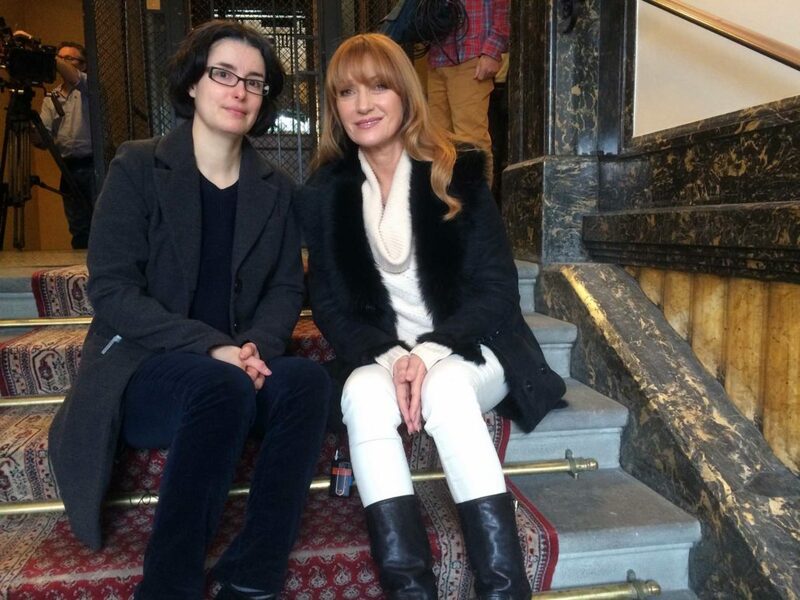 They included major awards for their research contributions during the course of the project, such as Ana Antic’s British Academy Rising Star Engagement Award, as well as her 2015 Fraenkel Prize in Contemporary History for her monograph, Therapeutic Fascism. 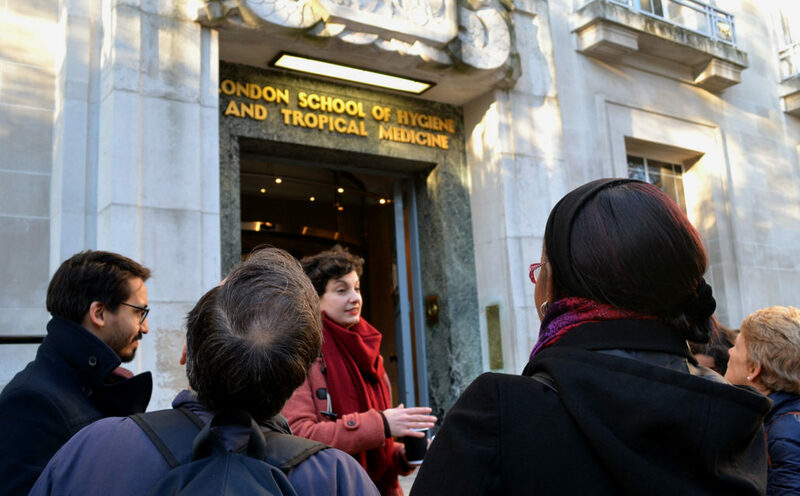 Dora Vargha was awarded a Wellcome Trust Seed Award for her project ‘Socialist Medicine: an alternative global health history’, as well as the J. Worth Estes Prize 2016, awarded by the American Association for the History of Medicine for best published article in the history of pharmacology, and the Young Scholar Book Prize by the International Committee for the History of Technology. 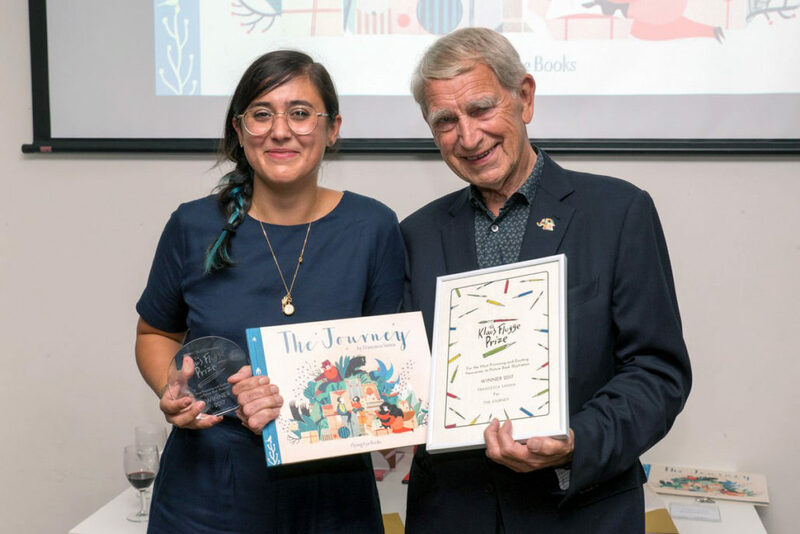 Francesca Sanna, who joined as a Visiting Children’s Author, won a series of awards for her book, The Journey, including the 2017 Klaus Flugge Prize for most exciting newcomer to children’s picture book illustration. Researchers also received a series of smaller grants for research trips and conference organisation, including three Wellcome Trust Small Grants in the Humanities and Social Sciences, as well as supporting grants from the Birkbeck Institute of the Humanities, Birkbeck’s School of Social Sciences, History and Philosophy, and the Society for the Social History of Medicine, among others. In addition, Siobhan Morris was awarded Seed Corn Funding for Impact Development from Birkbeck College. The project was also awarded the Birkbeck Public Engagement Award for Collaboration in 2017. Members of the project have also won prestigious research fellowships. Ana Antic was awarded a research fellowship by the Centre for Advanced Study, Sofia, to conduct research on re-education camps. David Brydan received a one-term visiting research fellowship at the European University Institute in Florence and an Eric Hobsbawm Scholarship from Birkbeck. Johanna Conterio was appointed Kathleen Fitzpatrick Visiting Fellow of the Laureate Research Program in International History at the University of Sydney. Dora Vargha won a research fellowship at the Consortium for the History of Science, Technology and Medicine to conduct research on polio eradication at Yale University. One of the most important contributions of the project was to foster collaborations between researchers from different academic institutions and disciplines, creating new networks of people with shared interests in a new history of internationalism. In the course of the project, the group worked closely with 10 visiting fellows, including two working on public engagement. 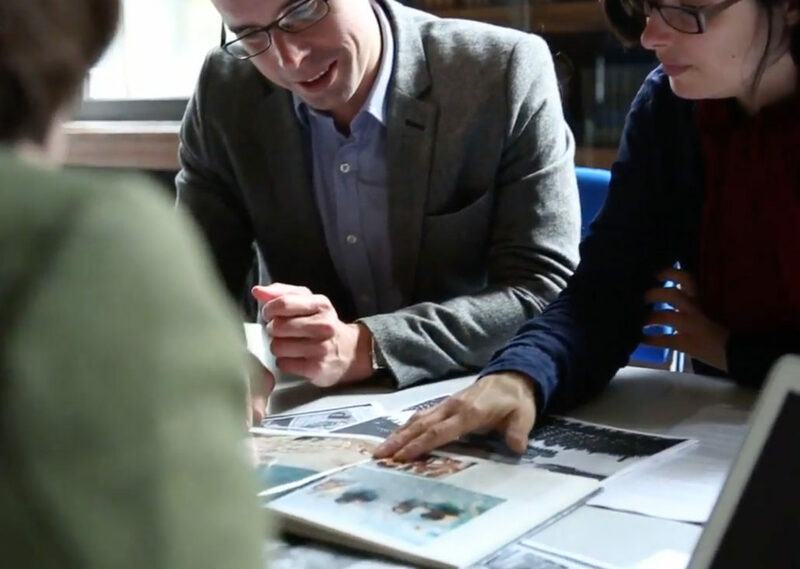 This collaboration was crucial to the project design and outcomes, helping the research group to make connections with new bodies of work and framing their research in novel and interesting ways. The project group disseminated its research findings in the form of research-led undergraduate and postgraduate lectures and courses. 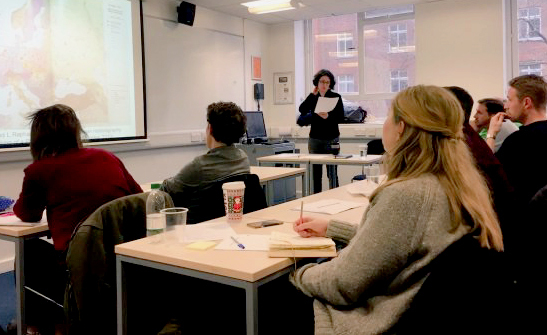 In total, the project’s researchers taught on over 10 courses at Birkbeck and supervised a range of undergraduate, postgraduate and PhD dissertations. Teaching also took place outside of the university classrooms. In summer 2015, David Brydan worked with the educational charity, The Brilliant Club, to design and run a course on the history of internationalism for twelve GCSE pupils from Woodlands School in Basildon. The programme aimed to prepare pupils for the demands of the new GCSE curriculum and provided an opportunity for pupils to discuss current debates around the EU, global migration, and the refugee crisis in their historical context. The project engaged in several collaborations with school teachers. It inaugurated the History Teachers’ Network at Birkbeck, as a forum to provide academic and professional support for secondary school teachers and teaching assistants who are current or former Birkbeck students. These activities will continue after the end of the project. The Centre for the Study of Internationalism will organise a lecture series for history teachers on key topics in school curriculum. In conjunction with the Historical Association and Ben Walsh (Associate Vice President of the Historical Association, examiner and textbook author), Jessica Reinisch and the project ran a Teaching Fellowship Programme on teaching the Cold War, entitled ‘The Cold War in the Classroom’, which applied some of the project’s key findings to a popular topic in the school curriculum. Ten secondary school teachers from across the UK took part in two intensive residentials and a ten-week online course, designed to update their subject knowledge, draw on the expertise of academic historians, exchange ideas about teaching practice, and create new teaching resources. Their teaching resources have been published on the Historical Association's website. Week-by-week reports and resources from the teaching fellowship programme are also available on the Historical Association's website. 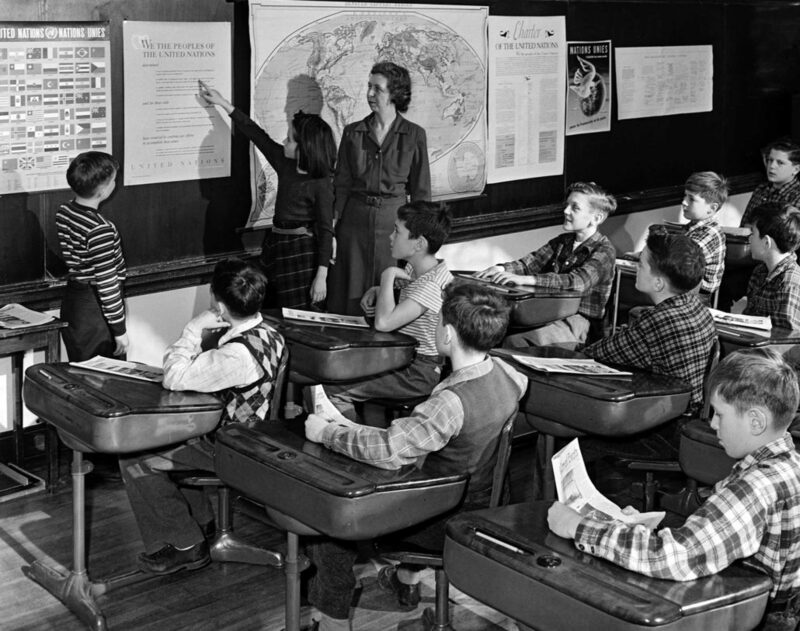 One of the project outcomes is a new online teaching companion on the history of internationalism, which provides a range of research-led teaching resources for use as part of the British history curriculum. The resource, entitled ‘Illuminating Internationalism’, features twelve chapters and a range of primary sources designed for exploring the history of internationalism in the classroom. The project group found several ways to present its work to and engage in a dialogue with non-academic audiences. As part of the 2016 Being Human festival, the project organised and led three walking tours on the theme of “International London”, to bring to life the history of international projects that took place in London. The event was selected as an example of best practice public engagement by the Being Human Festival and a case study of the event is featured on the festival’s website for future public engagement event organisers to refer to. In total, the walks were attended by 39 people. In February 2015, Johanna Conterio organised a public film screening of USSR Now (1958, dir. Michael Ingrams), the first British television documentary about life in the Soviet Union, and Opening in Moscow (1959, dir. D. A. Pennebaker), with a discussion panel about Soviet cultural diplomacy, at the Birkbeck Institute of the Moving Image. 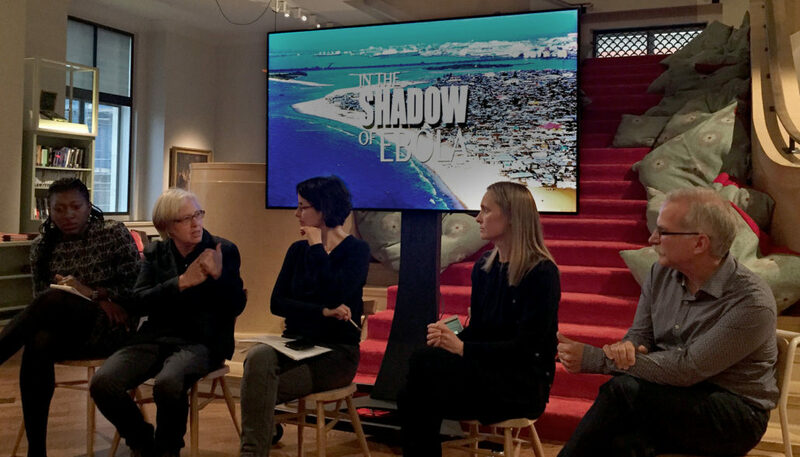 In May 2016, Dora Vargha conducted a film screening of the director’s cut of In the Shadow of Ebola, a film by Gregg Mitman (University of Wisconsin) and Sarita Siegel (Alchemy Films), which tells the story of the Ebola outbreak in Liberia. 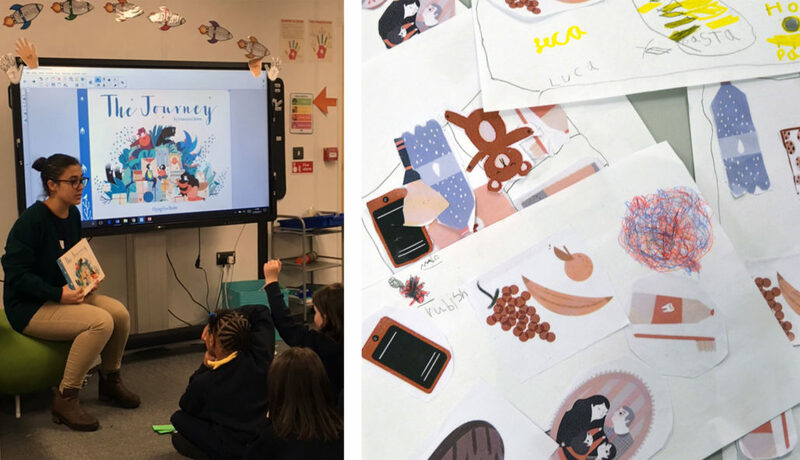 (L) Francesca Sanna delivering a workshop to pupils at Belham Primary School in Peckham, south London and (R) Materials made by school children during the workshops. The project collaborated with the award-winning children’s illustrator Francesca Sanna, whose first book The Journey (published in 2016 by Flying Eye Books, London) told the story of a refugee family’s flight from peril from the perspective of a young child. During her fellowship at Birkbeck, Francesca and the group explored how to get children to think about internationalism, migration, violence and war, and empathy with others. They also discussed different historical contexts and refugee policies in preparation of her second book project, due to be published with Flying Eye Books in 2018. Francesca and members of the project conducted workshops with over 260 children at three London primary schools. Alongside these activities, Siobhan Morris organised two lively workshops on children and refugees: Refugees and Children: Writing, Exhibiting and Depicting Refugee Stories for Children in March 2017 and Between Fact and Fiction: Refugee Narratives in Children’s Literature in June 2017. 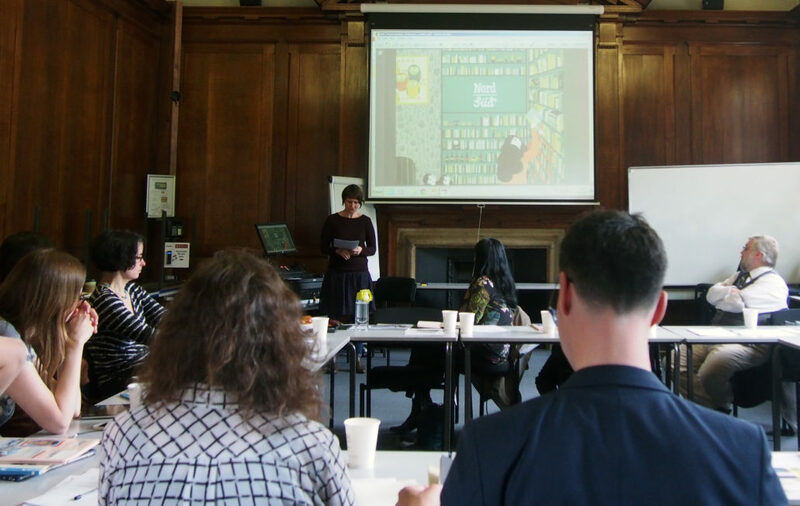 These brought together children’s authors, illustrators, publishers, booksellers, librarians and academics to explore refugee stories and the use of factual research, both historical and contemporary, in children’s books, films and exhibitions. Jessica Reinisch’s bibliography of children’s books on the themes of migration, refugees, and multicultural living was well-received among the workshop participants. Following the workshop in March 2017, Anne Harding was inspired to write a blog post on books for children and young people on the theme of refugees and migration. In addition to the academic insights generated by the project, it also proved to be a successful vehicle for the professional development of its members. All of the full-time postdoctoral researchers in the group were appointed to permanent jobs before the close of the project. Ana Antic is Lecturer in Twentieth Century International History at the University of Exeter; Johanna Conterio is Lecturer in International/Modern European History at Flinders University, Adelaide, Australia; Dora Vargha is Lecturer in Medical Humanities at the University of Exeter. David Brydan completed his PhD with no corrections in October 2016, and was appointed Lecturer in Modern European History at Birkbeck. From September 2018 David will take up a Lectureship in the History of Twentieth Century International Relations at Kings College London. Francesca Piana, who joined the project as a Visiting Fellow for 18 months with her Advanced Postdoc Mobility Fellowship from the Swiss National Science Foundation, left the project to take up an appointment as a Postdoctoral Fellow in Women’s and Gender History at the University of Binghamton, US, and is holding a Postdoctoral Fellowship (return phrase) of the Swiss National Science Foundation, based in Zürich, Switzerland. Casey Hurrell, who came as a visiting PhD student from Queen’s University, Canada, completed her PhD in 2015 and is now Manager of Research and Policy Development at the Canadian Association of Radiologists. Esther Kim, who joined the project as a Visiting Fellow and project manager for the website companion, was awarded a Joseph-Armand Bombardider Scholarship and Social Sciences and Humanities Research Council doctoral studentship at the University of Toronto, Canada. Siobhan Morris, who joined the project as Public Engagement and Events Coordinator, joined UCL as 'Grand Challenges Coordinator - Cultural Understanding and Justice & Equality' in July 2018. 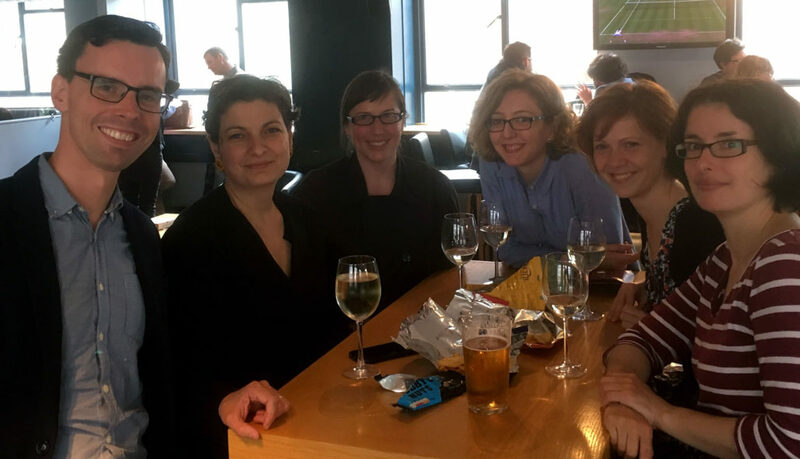 Jessica Reinisch, the project lead, was promoted to Reader at Birkbeck in September 2016. Although the project is now completed, many of the collaborations and conversations begun by the project are continuing under different guises. Several major outputs are forthcoming in the coming year. Further monographs by the group’s researchers and visiting fellows will be published in the coming year. A volume edited by David Brydan and Jessica Reinisch, entitled Europe's Internationalists, will be published by Bloomsbury in 2019. The project’s website teaching companion, Illuminating Internationalism, will be launched in 2018. David Brydan and Jessica Reinisch are also writing and editing a collection of teaching resources to be published by the Historical Association. Francesca Sanna’s new children’s book, Me and My Fear, will be published by Flying Eye Books in September 2018. The international network of scholars created by the project will live on in a new research centre at Birkbeck, the Centre for the Study of Internationalism.